Posted 1/11/2018 8:21am by Cherry Valley Organics. 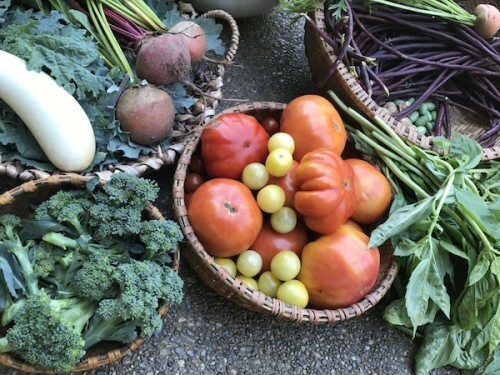 Sign-ups for our 2019 CSA Pittsburgh Farm Share Program are now open! We're excited to be able to provide your family with a wide selection of delicious, organic fruits and vegetables each and every week throughout the growing season from June 8th to October 25th. Cherry Valley Organics is one of only a few USDA Certified Organic farms in Western Pennsylvania, and our Farm Share program is among the most unique CSAs in Pittsburgh. For the equivalent of $25.00 per week, you get to enjoy oodles of locally-grown, farm-fresh goodness! You can sign up for our Pittsburgh CSA here or keep reading for more details about our customizable farm share program. Community Supported Agriculture (CSA) programs are a powerful tool for small farmers like us. They enable customers to invest in a local farm in exchange for a weekly or bi-weekly "share" of fresh seasonal produce. You provide early-season financial support to a small farm like ours by paying for part of your "share" at the start of the growing season, then we pay you back by delivering a box of delicious organic fruits and veggies weekly or biweekly from June through October. This cooperative is a win-win for both our small farm and our customers! We're able to purchase the seeds and supplies we need to grow our crops, and you're able to fill your kitchen with locally grown goodness for 20 entire weeks from June 8th through October 25th! 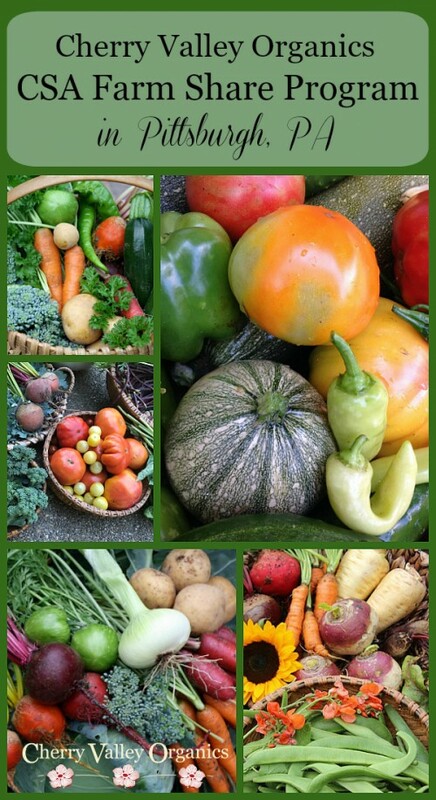 Keep reading to learn what makes our CSA program so special. What makes Cherry Valley Organics CSA Pittsburgh so special? In most Pittsburgh CSA programs, the customer has no control over what's in their weekly box of produce; the farmer makes that decision for them. But our Cherry Valley Organics Farm Share Program is far more flexible. We customize each and every Pittsburgh CSA box we deliver by filling it with the fruits and veggies each customer selects as their favorites. Don't like kale? We won't include any. Love heirloom tomatoes? We'll send extra! We put together every single farm share box with great care, and then deliver it to a neighborhood drop-off site where you pick it up at your convenience on a designated day. This year, we have an extensive list of drop-off sites available for customers of the Cherry Valley Organics CSA Pittsburgh program. You choose your preferred neighborhood drop-off site when you sign up, and you'll find your box of farm-fresh, organic goodies ready and waiting for you. As an added bonus, you also have the option of finding a lot more than organic fruits and veggies in your farm share box. 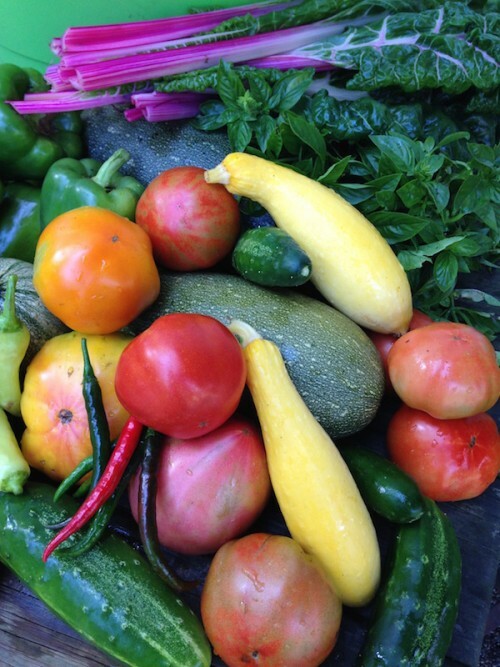 Our Pittsburgh CSA also offers specialty items for an additional fee. We can include a bouquet of our gorgeous specialty cut flowers, a canister of our delicious herbal teas, or a selection of our luxurious organic body care products. All of our CSA Pittsburgh customers will get a weekly email describing any add-on products available to them for that particular week. You'll also find recipes and notes from our growing team in your Cherry Valley Organics Pittsburgh CSA farm share deliveries. We love telling our customers about some of the more unique fruits and veggies we grow and how to prepare and enjoy them! Because our CSA Pittsburgh program is so unique, we have a limited number of spots available each season. Sign up today by clicking here! 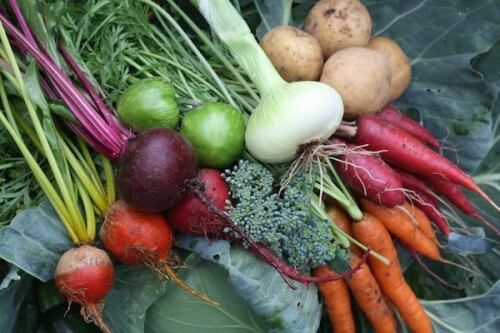 To see a list of what fruits and veggies you're likely to find in your CSA box, click here. If you have questions about our Farm Share Program, feel free to email us at info@cherryvalleyorganics.com.